Caraselle Direct – Home Accessories Products Launch new innovatio product topster for milk pourer and check how to pour your milk. 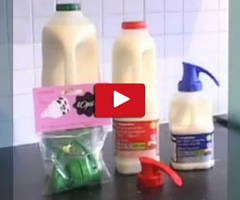 Topster Milk Pourer Shows You How To Pour Your Milk! There are very few things in life you can get for under £2. But there are even fewer that are under £2… have won an Award… are so useful you will use them every day… and make you life easier! However, I wanted to let you know about one that ticks all these boxes! Topster is the brilliant British designed product which scooped the top award at the British Invention Show 2008… and it’s easy to see why!